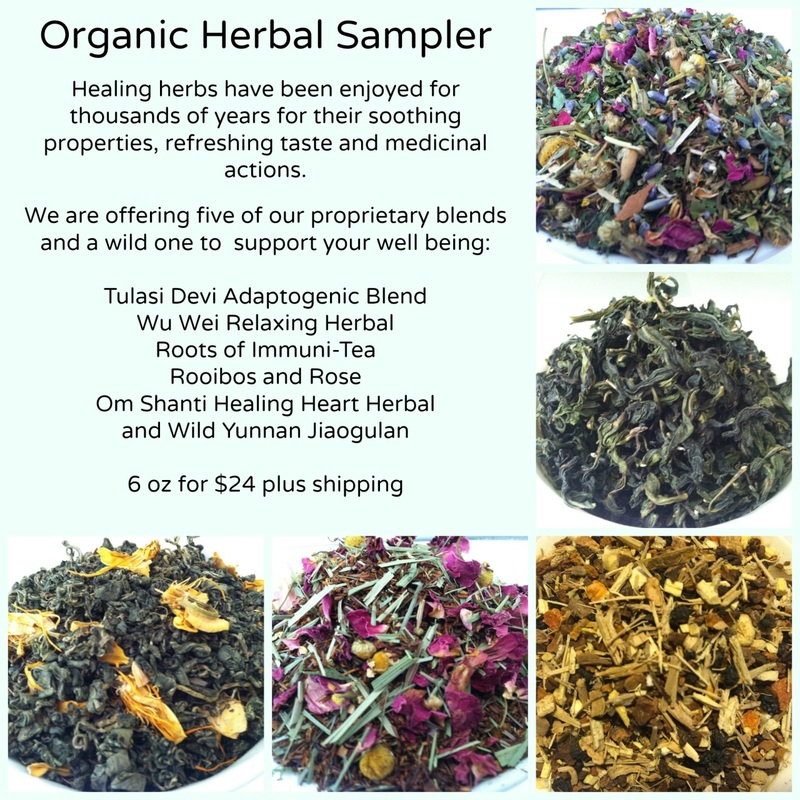 Brewing instructions, tea descriptions and tea poem are included in each order. 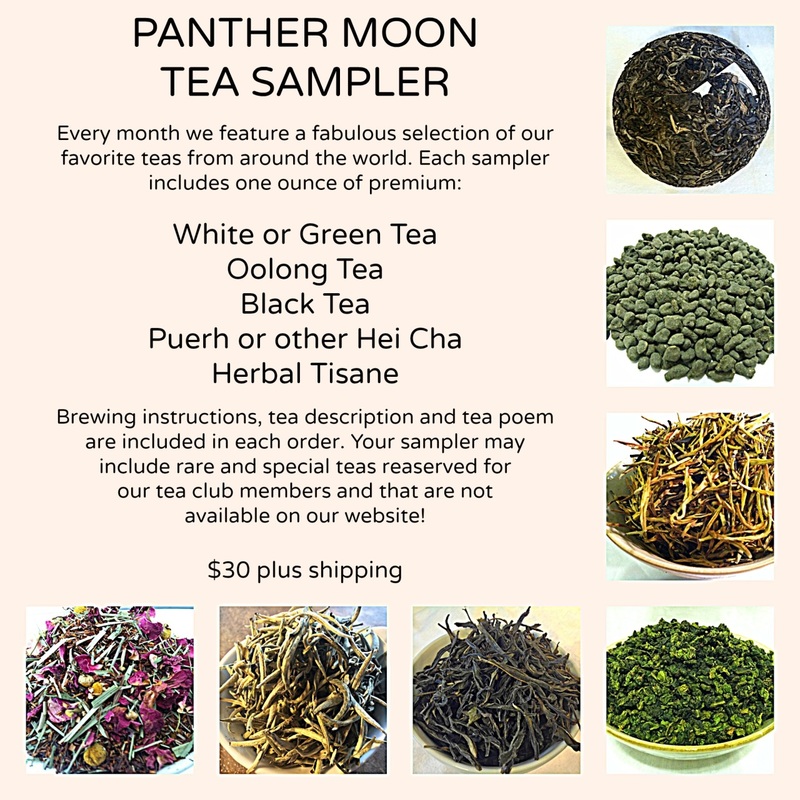 Your sampler may include rare and special teas reserved for our tea club members that are not available on our website! Treat yourself to hours of peaceful contentment over beautiful cups of tea crafted by tea masters from a variety of famous tea growing regions. Many tea lover drink Yunnan teas for the unique character, rich, bold flavors and wild energy they impart to the drinker.. The Ancient Tree teas that grow in this region of South West China are revered as living ancestors and are said impart wisdom, strength and other positive virtues to its drinker. Every month we offer a new selection of five premium, hand-picked and expertly processed teas - from white to fermented - that are grown without pesticides. Old tree Sheng and Shou puerhs are featured. 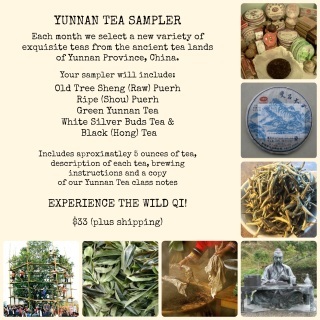 Enjoy the naturally potent health benefits of Yunnan teas and enjoy a walk on the wild side. Brewing instructions, descriptions and a copy of our Yunnan tea handout are included. Each sampler includes aprox. 5 ounces of tea. 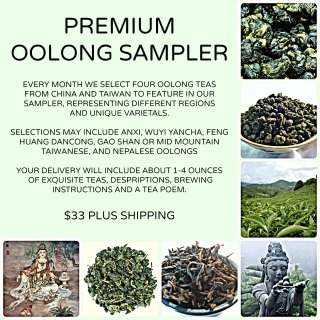 Every month we select four exquisite oolongs from famous tea growing regions of China, Taiwan and around the world, each a representation of unique cultivars. 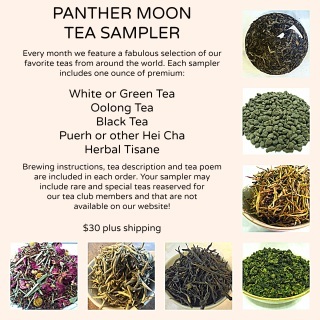 We import our teas directly, including rare and special teas that may not be listed on our main website but reserved for our monthly tea club members. Expect to be delighted with fine oolong selections from Fujian and Guangdong Provinces in China, Taiwan and abroad. Enjoy the supreme fragrance and depth of flavor and aroma that only oolong teas offer so generously to the drinker. Anxi, Wuyi Yancha, Phoenix Dancong, Taiwanese gao shan and mid mountain oolongs are featured. About 4 ounces of tea, descriptions, brewing methods and a tea poem are included in each order.